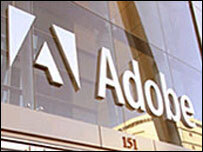 Adobe has unveiled a version of its Flash media software to let copyright holders embed ads and control usage. The new software should also allow video to be played offline, whether on computers or portable devices. Flash is used on websites such as YouTube, the Google-owned video sharing site dogged by rows over the use of copyrighted material. The launch comes as Microsoft took the wraps off its own competing online media platform, Silverlight. The product - formerly dubbed WPF/E - also includes copyright protection. The software giant has long wanted to take on Adobe's dominance of online video, and has signed up several content providers including Netflix and Major League Baseball. Flash - originally popularised by Macromedia, a firm then bought by Adobe - has been the biggest player in online video for some time. Its dominance has been secured by the huge popularity of both YouTube and dozens of other video sharing services. Although there are programs and services available to pull content from such sites and convert them to be viewed offline, this is the first time Adobe has launched its own dedicated piece of software to make it possible. But the big seller for Adobe is the ability to include in Flash movies so-called digital rights management (DRM) - allowing copyright holders to require the viewing of adverts, or restrict copying. "Adobe has created the first way for media companies to release video content, secure in the knowledge that advertising goes with it," James McQuivey, an analyst at Forrester Research said. Content publishers are promised "better ways to deliver, monetize, brand, track and protect video content". The new software will be freely available in the same way as other products such as Acrobat Reader and Flash Player, for both Windows PCs and Apple's Macintosh computers. Microsoft is promising that Silverlight, too, will work with both Windows and Macs.